Lucy in the sky with black holes, big bangs, mind-blowing theories, and Nobel prize gossip. This international-bestseller was written to invite the masses into the world of cosmology. I remember reading parts of it as a kid, but it was great to finally read it from cover-to-cover. A Brief History of Time attempts to cover some very basic curiosities & questions about the universe and give a glimpse of the world of science & our understanding of the universe. Who made it? How was it made? When was it made? What was the past and what will be the future of us? … are answered in the book! Even though it talks about some of the most mind & reality bending theories of the scientific world, Stephen Hawking does a wonderful job of explaining them as simply as one could do (and still be accurate). And he does that with almost zero maths or equations involved. The only equation I remember seeing is E = MC2. In fact, depending on what edition you get (I’ve the 1989 Bantam Edition), it has pretty pictures in it! To be able to tell these things with such simplicity and evoke curiosity is remarkable. I wish I had read this as a kid. 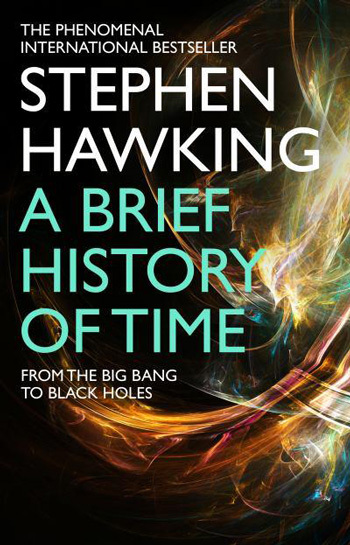 Back to the content, the book is more of a brief history of black holes rather than time. It does deal with it but that doesn’t come across as the central theme. Since Stephen Hawking’s research was mostly around black holes, that makes all the sense. But the title didn’t. Also, it’s hard to keep a track of what theories are complete and accepted, what theories are partial and rejected. A bit of clever formatting would’ve done the trick. If it becomes too much to keep up with; use the appendix. It’s very useful! The book also made one thing very clear to me: Religion has been and still is one of the most hindering factor in advancement of science. The second factor is the personal comfort of a scientist with a certain theory, but I guess that is somewhat required to be one. It’s full of who won Nobel prize, for what and when. At one point Hawking sounds like a Nobel prize gossip columnist. ‘The Arrow of Time’ (chapter) is my personal favourite, finally I got the hang of some things that I’ve alway been curious about. The best part was when Hawking invites philosophers to keep up with the science and keep thinking & asking questions. That’s where science began after all, the philosophical curiosity of the human mind. On the other hand, the people whose business it is to ask why, the philosophers, have not been able to keep up with the advance of science. A Brief History of Time by Stephen Hawking is an eye-opening experience and a must read; especially for children of the curious kind. This might suggest that the so-called imaginary time is really the real time, and that what we call real time is just a figment of our imagination. In effect, God was confined to the areas that nineteenth-century science did not understand. But maybe that is our mistake: maybe there are no particle positions and velocities, but only waves. Published on October 1, 2013. Updated on October 11, 2013.